The focus of this site is on mobile web apps so I rarely cover native apps. However I prefer using a native app for password management. I want my passwords available instantly and everywhere regardless of whether I have a wireless signal or not. I also need a password management solution that works on all my devices using the same encrpted password database. I use Windows and Linux PCs as well as Android andSymbian smartphones and basic feature phones with Java ME support. There are some excellent comercial password mananagement utilities that support multiple platforms. But none that I know of support all the platforms I use. Cost is also an issue when you use as many devices as I do including review phones that I have just for only a couple of weeks. My solution for password management and one I recommend highly is KeePass Password Safe. It’s free open source software (FOSS) for securely storing passwords, PINS, social security numbers and any other data you want to keep hidden from prying eyes. Originally a Windows PC only app, KeePass has been ported to many platforms including; Mac OS X, Linux, iPhone, iPad,Android, BlackBerry, Java ME, Windows Mobile and Windows Phone 7. There’s a list of all ports with links on the KeePass site. I use KeePassX on my Linux laptop. The copy on the laptop is my master password store and is where I edit and modify passwords. I frequently copy the KeyPass database (using bluetooth and my LAN) to my other PCs and phones that are running a variety of KeePass versions. KeePass Classic Edition on Windows XP, KeePass Droid on Android, first image, and KeyPassJ2ME on Symbian and dumbphones, second image. The KeyPass apps I use work well together. KeyPassJ2ME is noteworthy for its support for basic phones that don’t allow Java apps to access the filesystem. A companion KeePass Packer desktop app lets you build a special version of KeePassJ2ME with a read-only copy of the password database encapsulated in the app itself. 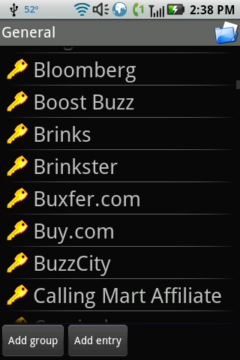 Several of the mobile implementations of KeyPass have mobile friendly download sites (listed below) which I’ve added to the WapReview Mobile Directory‘s mobile downloads section. This entry was posted in Apps and tagged Android, iPhone, Java ME, KeePass, Linux, OS X, WP7 by Dennis Bournique. Bookmark the permalink.